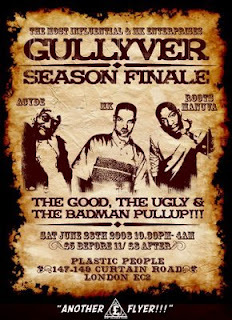 On the 28th of June Gullyvers will be having their Season Finale night in London's Plastic People. This should be another dope Gullyver's night. DJ MK and Acyde will be joined on the night by Roots Manuva. Anyone who has been to a Gullyver's night before knows to expect good atmosphere and a funky mix of breaks, hip hop, reggae and 80's pop. Check the Flyer below and pencil it into your diary.